Every January, for a number of years, we’d dig out our copy of the D’Aulaires’ Book of Greek Myths and read through our favorite stories to start preparing for the National Mythology Exam. Hosted by the Excellence Through the Classics, NME is a gentle way to introduce kids into the dynamic world of mythology. It’s not just about studying literature or Ancient Greece. It’s a cultural literacy lesson that brings our daily lives into focus. Hypnosis isn’t just some pseudo-science. It’s named after the god of sleep. Documentary that gives a deeper understanding of how the Greek myths came into being. Recommended: grades 7 and up. Participating in the NME is pretty straightforward – and it’s an opportunity open to homeschoolers! Simply send in your registration form by January 15. Read the stories. Do some fun activities to help your kids remember their facts. And then, take the test in the last week of February or the first week of March. The test is multiple choice. Kids fill in bubbles on a scan-tron answer sheet. You mail the answer sheets in and they’re scored. Everyone receives a certificate of participation. High scoring kids may also received a bronze, silver, or gold medal! Older kids are required to complete more portions of the tests than younger students. But, hey, if your 3rd grader has read the required books from the Iliad and they want to take that part of the test, too, they can. NME is cool like that. The minimum ages are guidelines. A kindergartener can participate, if they can take the test independently. NME exam topics change every year. Some years, kids study Jason and the Argonauts in-depth. Other years there’s a focus on mythological monsters. Really motivated kids can also study Native American , African , and Norse myths , also. High school students will be required to read a selection from either Homer’s The Iliad , The Odyssey , or The Aeneid . Check out the 7-year topic rotation to see what’s up for this year. template that looks like Magic cards. You provide your own text and image – either drawn by the kids or found online using a google image search. You can use these cards for matching and recall games. Draw a Greek geneaology tree. The D’Aulaires’ book has one that you can use as a model on the 1st page. Make a stick puppet play. We did this with Herakles, because it helped us remember all the different tasks he had to complete. Make a monster encyclopedia about the origins of Cyclopes, Medusa, Typhon, and others. If you prefer a games-based approach to learning, you can find some of the mythology review games I created for my guys and for the mythology summer camp I used to teach at the community college. I’d love to hear how you learn about mythology with your kids! This entry was posted in Books, History and tagged Greek, myth, mythology, national mythology exam, NME, Roman by alessa. Bookmark the permalink. Thanks for the reminder! We did NME last year and my kids are hoping to get a medal this time. One thing I did was make a memory matching game. 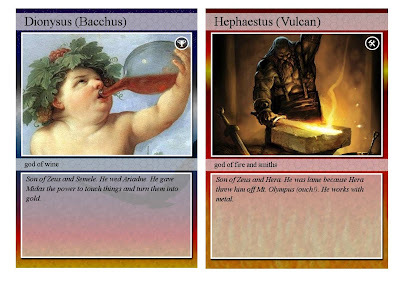 I listed the Greek gods and goddesses names on flash cards. I made a set of Roman names and also symbols. We’d play memory with them. It was an easy on the go activity we could play while waiting for appointments or when one child was in music lessons.